which is plain to see whenever you attend a session at RukThai camp. pushing us to our limits and encouraging us to keep working harder. has put into training me. I would just like to say thankyou for all your help in and out of training, I have really come to feel at home with Rukthai and I will endeavour to follow your humble example with great perseverance. I joined the Rukthai Camp in November 2010. Master Danny has encouraged, as well as other Rukthai members have motivated me to learn and adopt the teachings of Muay Thai. I come from a Martial Arts background where I did Shotokan Karate for many years; the training I've endured in the Rukthai Camp has excelled me to greater heights. I have learnt how to channel my strength as well as focus my mind for self-defence. The rigorous training has helped me to lose almost 2 stone within a 6 month window. My physical fitness, flexibility and stamina have been pushed to the next level! supported us, and congratulations to all the LMTA fighters for their superb victories. he has in his students and training methods. I Fight, For Sure, To Win... These words epitomise the spirit of RukThai Camp and these are words I will cherish and live by till my last breath. I would like to add my thoughts to those before me who have discussed, argued and philosophised the Martial Arts. To me, the Martial Arts is not simply knowing how to kick or how to punch or do someone in. It is knowing how to live life. Muay Thai, and more importantly RukThai Camp brings me back full circle more times than I can think of. From winning my first fight, to dealing with losses. To helping me with work, to helping me with various situations. There are countless examples of where Muay Thai has helped me and I could go on and on. But what I'm trying to say is, what I have learnt, and continue to learn to this day, makes me a fuller human being. I go back to when I was a kid in the 80's! learning Muay Thai from Arjarn Danny and yes, things have changed since then, but if there's one thing that has not changed is his ability to inspire and instil confidence in people. His ability to know what you need to do to be better, to be stronger! His teaching methods are without a doubt the best in the country. I have fought in the ring and owe a lot of my success to him. It is a testament to him that I have been training here for so long. For those wishing to learn authentic Muay Thai for competitions, fitness, self defence or simply "a way of life", you have come home... To all RukThai Camp students, new and old, I wish you great success in whatever you may be doing and wherever you may be. First of all the site is looking great,keep on adding. Secondly, i would like to thank Master Danny for all his help and ongoing support over the past couple of years. Keep up with the good work your an ambassador for Muaythai and a true friend. It is an honor to be training with the Rukthai Camp and from seeing the level of quality present here I would be pleased to attain just half the skill set of that protrayed by the seniors. Its not often you're blessed enough to find a true master, so to have one who possesses exceptional skills, understanding of students and various methods of teaching shows what good hands Rukthai Camp is in. Overall it's a Great website, Great camp, Great people, Great Master, only thing not so Great? I only found you four months ago. I met Arjarn Danny back in 2002 at his Acton Town Hall IMTF Area Championships Show, the first thing I noticed was that his fighters were very talented, it was that show that made me realise that this was the way forward. I first went to train with Arjarn Danny to learn the Krabbi Krabbong, he said to me "before you can learn Krabbi, you have to learn Muay Thai", up until that point I thought I knew Muay Thai, how wrong I was I still remember my first lesson, and seeing myself in the mirror at Energize gym in Hammersmith, I looked like a right brawler, it still makes me laugh, but since then I've learnt alot about Muay Thai, spiritually and physically. He's not only changed my teaching style, he's also changed my life. Through his teachings my students have benefited. I would just like to say Thanks Arjarn for putting me in the right direction. In response to Sukh's message I must say that I am very happy and proud to be part of the Rukthai camp! Thanks to Kru Gary of London muaythai who introduced me to Ajarn Danny and the Rukthai family. Great camp to be part of. Ive made some really good friend's here and the training is excellent. One love for the whole camp. Keep training hard. Peace... ! It is great to see that you are keeping the traditional Muay Thai and Krabi Krabong arts alive and people can get the opportunity to study these arts in the pure form that was practised in the old days in Thailand. 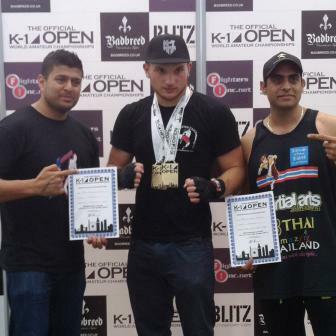 I first trained at the Ruk Thai camp at the age of 20 and feel thoroughly priviledged to have done so. The lessons I have learnt from Ajarn Danny and all of his students have made me a better man for it. To this day, I am amazed that someone so accomplished remains so passionate to teach others with a degree of humility and class that makes every lesson a pleasure to attend. New site is looking very smart. I have been coming to RukThai camp for nearly 5 months now, really really enjoying it. I was introduced to RukThai Camp by Ali ( Owner of Ace Cutz Barber Shop) He was always telling me to come and train, So eventually i did come down and i loved it. Arjarn Danny has been amazing and very helpful to me i enjoy the training and everything that goes with it. Rukthai has definately been a good and positive step in my life i have been recommending Rukthai to friends & family. Rukthai all the way ! I have been training now with the camp for just a few short weeks and I am amazed that in that time I have learnt a lot of things from Master Danny and the other members of the camp. Not only have I learnt about Muay Thai but also about myself which is great. I consider myself extremly lucky to have found such an excellent camp to train in, and find it an honour to recommend the camp to others. With the fantastic family spirit and the excellent leadership of Master Danny this camp will go on forever. I joined the Rukthai camp recently and I have to say, I'm hooked. I have realised how lucky I am to have found this camp. The people are great and everyone trains really hard. I have also been blown away by the skill, knowledge, dedication and inspiration that Master Danny brings to each and every training session, I can clearly see why he has many dedicated students who have remained with him for so many years. It is an honour to be taught by him and be part of the Rukthai family. See you at Rukthai soon. The new website looks great. ! Very good website, easy to navigate and very informative. Keep up the good work and the promotoin of Muay Thai to this level. Really like the photo gallery!! Loads of good messages!!! Very inspiring. All my suport to a true teacher. Ever since I was introduced to Muay Thai by Master Danny I quickly developed interest, love and respect for it. Muay Thai is a great form of exercise for the mind, body and soul and so there has always been so much to learn by way of form, technique and strength. Master Danny deserves so much recognition for his dedication and committment to Muay Thai and its students. He is truly inspirational and exceptional and I am ever grateful for what I have learnt and will continue to learn. It has taken a positive effect on my life and opened up new avenues of interest. Great site and thanks for the informative emails and keeping me up to date with the RukThai Camp. Firstly I would like to say it's an honour to be a part of Ruk Thai camp and the whole Muay Thai family, I looked for alot of places in the U.K to learn the true art of Muay Thai but found that they don't really teach Muay Thai but more kick boxing style thai boxing. When i met Master Danny i felt an aura around him i felt that as if this is what i have been looking for a long time. I have been training for a few months now and in these few months i have learnt alot thanks to Master Danny. I hope i can be as good as him one day.